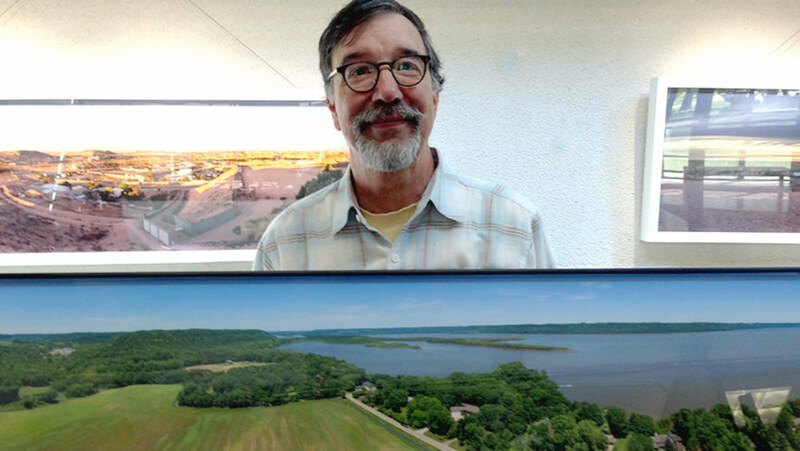 David Husom's one person exhibit of the Upper Mississippi River Project opens today at the Anderson Center in Red Wing Minnesota.The exhibit contains over 30 photographs and includes large scale conventional photo prints, backlit transparencies, floor graphics and a 4X20 foot hanging circular banner. The photographs, taken over an 18 month period, document the landscape and towns in the driftless area of the Mississippi valley from Hastings to Winona Minnesota and Prescott to Fountain City Wisconsin. Taken with a UAV or drone the 360 degree panorama photographs show how the Mississippi River has informed this rich environment. This weeks Red Wing newspaper the Republican Eagle features a cover story on the coming exhibit at the Anderson Center of David Husom's photographs and installations. The one person exhibit opens October 5th and runs through November 21st. This Summer's Anderson Center Summer Celebration of the Arts features the first exhibit curated by the new director Stephanie Rogers. The show, titled the Summer Print and Photo Showcase, includes the work of eleven printmakers and photographers. It includes three of my newest works of panorama photographs of the Australian Outback town of Coober Pedy. Click on the images below to see larger versions. The show is up until mid-September at which point the next show is a one person exhibit of my own work -- The Upper Mississippi River Project. In Faces Places the charming 89-year old French New Wave filmmaker and photographer Agnes Varda teams up with acclaimed 33 year-old French photographer and muralist JR to co-direct this wonderful road trip documentary. The kindred spirits discuss French image makers and visit Henri Cartier-Bresson's secluded grave and go searching for Jean-Luc Godard, who JR bears an uncanny resemblance to. But primarily they tour the French countryside in a van made out to look like a giant camera. In reality it is a photobooth and giant printer. The people they meet and photograph end up plastered at humongous mural size on the sides of village buildings, barns, and even stacks of shipping containers. The film has come and gone in the Midwest but hopefully it makes it to Netflix or Amazon. It has been shortlisted for best documentary this year. Let's hope the Oscar buzz gets it the attention it deserves. And best of all it is non-political at a time when we all need relief. But at the same time it is a celebration of friendship and human nature.